The presumptions of Christianity, and that of Reform and Conservative Judaism groups, that the books of Moses were divinely inspired, i.e., originally written by people in whom God produced thoughts, has been challenged by the evidence that each and every verse of the Biblical story of creation had been given directly to Moses by a Supreme Power. 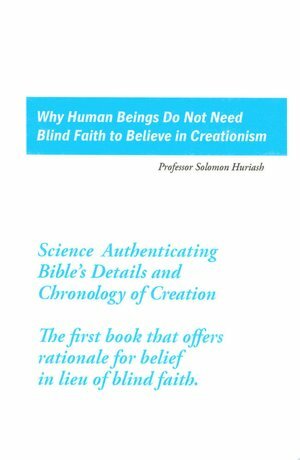 Author/researcher Professor Solomon Huriash, in his book, “WHY HUMAN BENGS DO NOT NEED BLIND FAITH TO BELIEVE IN CREATIONISM,” has demonstrated that every verse of Genesis 1 is literally in-sync with the teachings of modern science, and that is the proof offered that only a Supreme Power had provided Moses with the details of creation as it would have been humanly impossible for Moses, or 1000 like him, to have known of every basic factor and their exact chronology in the creation story. Thus, Huriash has presented the greatest academic challenge to organized religion in our time. Huriash states that what made his findings possible were the discoveries over the last 75 years, such as those that enabled scientists to prove that 6 days of “cosmic time” equals the billions of years of Earth-time, as measured by the same clock, because of the effects of gravity on time. Among other findings were that the Bible did mention dinosaurs and we now know that birds evolved from a winged species of dinosaurs. Indeed, things learned today could never have even been imagined by the sages of yesteryear. Professor Huriash proves to be an iconoclast as he uses for the translations of Genesis 1 the exact meanings of the Hebrew words as they were understood by the ancient Israelites, as some words and meanings differ from what we learn today. Thomas Jefferson had said that the problem with organized religion is that it calls for blind faith and what is really needed is a rationale for belief. Huriash supplies that rationale by demonstrating the Bible’s sync with science. Please see our website www.landpublishing.com for more details and to order, or go to Barnes & Noble for hardcopy or ebook.